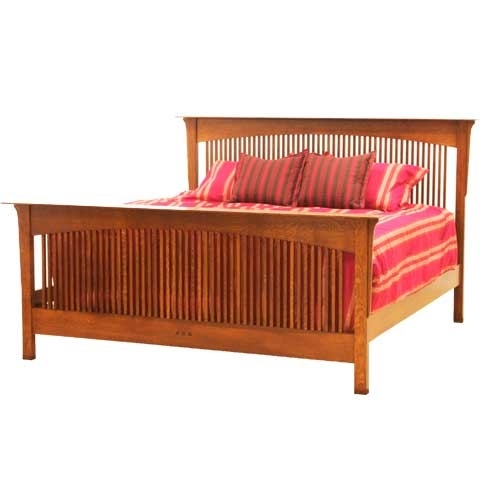 Our San Marino Arched Spindle Bed is constructed with mortised and tenon joinery to last a lifetime. Possibly our most beautiful bed and as beautiful as it is built. You may notice the arch of the Spindles on both the Headboard and Footboard, the beveled Top Crown and the Signiture End Grain inlay on the Footboard. Incredible attention to detail only found in our Clearly Amish Collections. The San Marino Spindle bed comes with Headboard, Optional Footboard, Side Rails, dovetail box spring crossmembers and full center supports. Made in the USA. Our Clearly Amish series of furniture has a complete selection of three Bedroom Styles. Every piece is "Bench Built" and hand crafted for exacting quality. We use hand selected, old growth, 5/4 Quartersawn Solid Oak and Cherry wood from renewable sources. Each piece uses Mortise and Tenon construction, hand applied finishes with a conversion varnish, the most durable finish available. A perfect addition to your home.